Mazda Mazda6 Fuel Economy Pros and Cons | Page 1 of 2 | Why Not This Car? What drives people to buy (or not buy) a certain car? 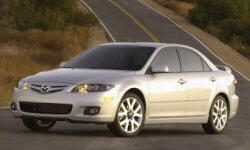 TrueDelta's members share Mazda Mazda6 pros and cons based on their real-world driving experiences. The Honda Accord also has a highway fuel economy edge thanks to its smaller engine and ten-speed (vs. six-speed) automatic transmission. Although both cars scored 23 mpg in the EPA's city test, on the highway the Mazda trails by three mpg, 31 vs. 34. Rarely got out of the mid-20s, even on long road trips by myself. I expected better from a 4-cylinder engine, even in a car this size. Again, my 1994 Honda Accord did better, routinely cracking 30 MPG on road trips. This year every Mazda6 has a 184-horsepower 2.5-liter four-cylinder engine under its hood. The 2013's less powerful (170hp) 2.5-liter four managed only 21 mpg city, 30 highway. The 2014 does far better: 26/38 with the automatic transmission and 25/37 with the manual. Fuel economy over 71k has been 32.1 MPG. Pretty darn good for a non-hybrid and driving 75-85 mph pretty consistently. Good practical car, and good looking too! Not real happy with MPG. I get around 25 on the highway, about the same as my Pontiac Montana I used to own. 24 MPg in the winter and 27 in the summer is not bad for a sedan that can do 140 mph (as fast as I have gone in the thing. Compared to SkyActive not great but then the newer Mazda&rsquo;s are about flue economy more than performance. 26/38 rating is better than other sedans in its class. Averaging 32 with daily up and down mountain treks. Car maintains speed well and uses little gas keeping speed up. Not necessarily a dislike, just a natural trade off for having 270 horsepower on tap. Averaging 22mpg with mostly city and traffic driving. It actually still bests my old 00 VW Golf turbo, which typically mustered only 20mpg with half the horsepower! The fuel economy is in the upper range of the norm for this class of car. So far seems higher than EPA estimates. Gearing close so that I can drive 30-40 around town in 5ht or even 6th. 6th should be further out to improve mileage even more. 28.5 mpg. Driving to the interstate, taking the interstate to the other side of town, then driving to work (or home). Not very good unless you are on the highway only cruising. On the highway it can get 28+ mpg. However, in mixed driving you will be lucky to get 20 mpg.